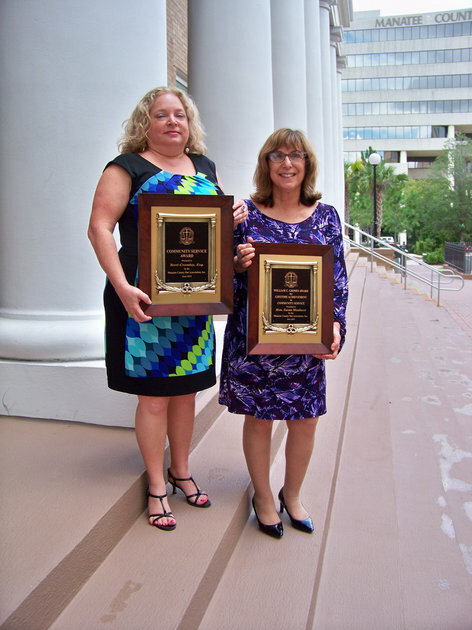 A Manatee circuit judge and local attorney have received awards from the Manatee County Bar Association for their service to the community. Circuit Judge Susan Maulucci and attorney Terri F. Cromley were honored in June at the association’s annual meeting, according to a release issued Monday by the association. Cromley, who is the managing partner of the Bradenton office of Carlson, Meissner, Hart & Hayslett, P.A. and practices in the area of Workers’ Compensation and Social Security Disability Law, served for more than a decade as a board member on the Tampa Bay Friends of 440, a scholarship fund that assists dependents of workers who are somehow involved in the Florida Workers’ Compensation system. “A past president of the Manatee Chapter of Florida Assn. for Women Lawyers, she is a champion for charitable fundraising, enthusiastically and creatively chairing fundraisers for organizations such as We Care Manatee, Feeding Empty Little Tummies, Just for Girls, Next Step and PACE Center for Girls,” a release states. According to a release, Cromley said she is very proud to be a part of the Bradenton community. “It is truly The Friendly City and I am honored to do my small part to support the great people here,” she said in a written statement. Nominations for the awards were submitted by fellow members of the Manatee County Bar Association and the recpients were chosen by members of a judging panel.